For over 22 years the Lil’DMXtertm and the Lil’DMXter2tm have set the standard for DMX512 testing. The DMXter4 RDMtm takes the next step in protocol testing. It provides expanded DMX testing along with growing support for RDM testing and configuration. Who else would you trust to support the new standard? The DMXter4tm is simple to use. Eight buttons run its menu-driven software. 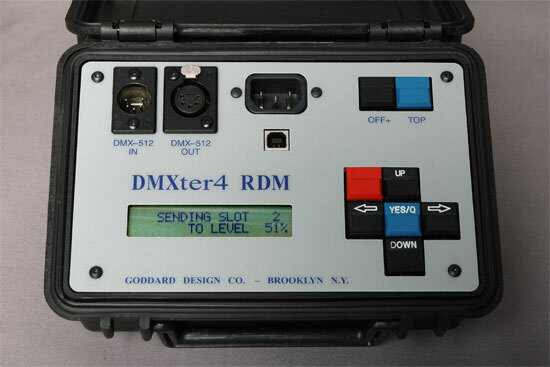 The DMXter4tm uses a back lit 40-character display. Some functions can drive a PC using the USB port. Software updates are done via the USB port. The unit comes in a rugged water-resistant case, tough enough to ride in your tool kit or cable hamper. The DMXter4tm should be easily used by anyone who has used a Lil’DMXtertm; however you will see and feel many subtle improvements.